For users of the Plasma Module, COMSOL Multiphysics® version 5.4 brings global modeling of non-Maxwellian discharges, a redesigned Boltzmann Equation, Two-Term Approximation interface, and pulsed electrical excitation for capacitively coupled plasmas. Read about these and more plasma updates below. Linear and quadratic in the above refer to the shape function order used to compute the EEDF. When either of these options is selected, further options appear as well to discretize energy space. The EEDF must be initialized using a separate and new study called EEDF Initialization. The solution from this study is then fed into a normal Time-Dependent study as the initial condition.You can find this feature used in the new model named Global Model Coupled with the Two-Term Boltzmann Equation (boltzmann_global_model_argon). 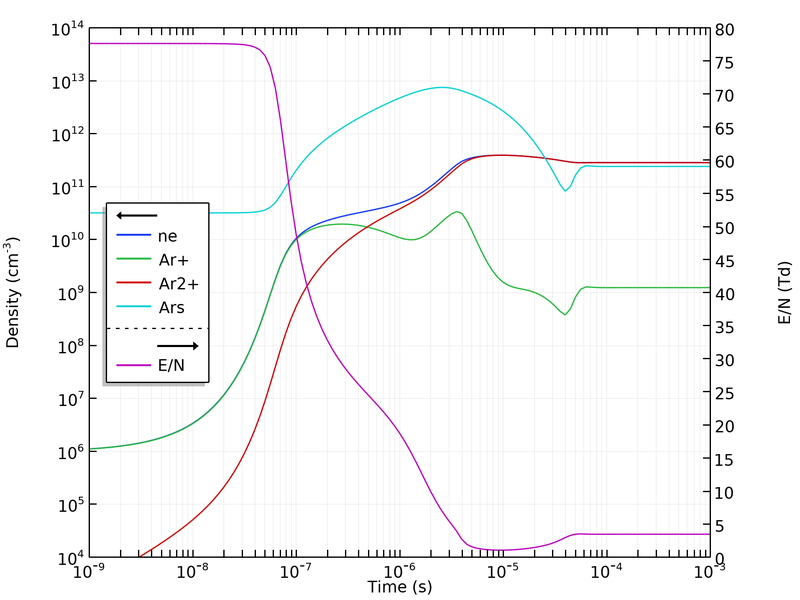 The Boltzmann Equation, Two-Term Approximation interface has been redesigned, and is now only available for 0D components. The interface is now more stable when solving, as it is possible to compute the maximum energy based on the solution, rather than using a fixed value. This means that parametric sweeps over a large range of mean energies will produce more accurate results over the entire mean energy range. 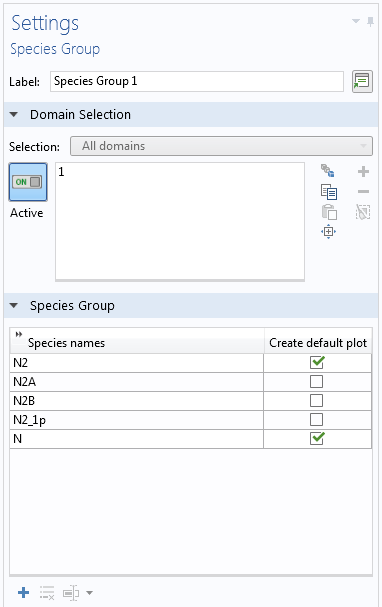 A new Results section has been added to make it easier to customize the default plots generated when solving. You can now model capacitively coupled plasmas that are driven by a pulsed excitation rather than purely sinusodial. This is available in the Plasma, Time Periodic interface. You can specify the number of on- and off-periods, as well as the number of periods to ramp up to full power and down to zero power. Additionally, to make the discretization of the pulsed signal optimally efficient, a mesh suggestion can be generated by the feature by checking the box Create a mesh suggestion for the extra dimension. You can see this feature used in the new Pulsed Capacitively Coupled Plasma model (pulsed_ccp_discharge). 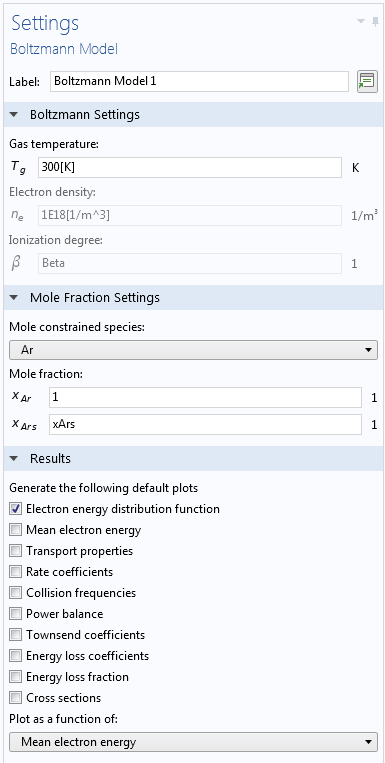 The Species Group feature, available in the Plasma, Time Periodic interface can be used to ensure that mass is perfectly conserved in chemistries involving multiple different elements. This is needed in order to model gas mixtures such as Ar/N2 or N2/O2 correctly. It also makes the problem more stable when solving, as it enforces that mass conservation remains perfect at every nonlinear iteration taken by the solver. 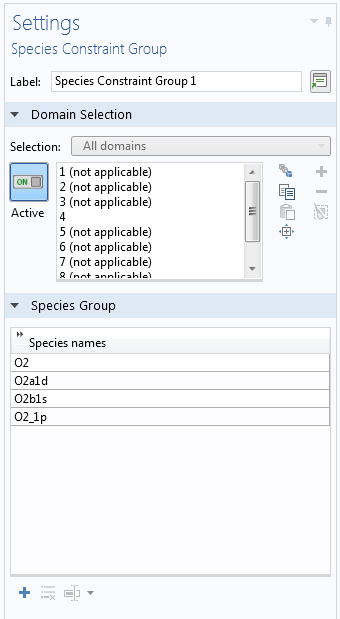 The Species Constraint Group feature takes a list of species and constrains the mass fraction to the initial value even when solving. This is useful for complex chemistries, as you no longer have to deactivate and reactivate species and reactions during model development. The species can then be quickly reactivated in a second study, meaning troublesome (highly reactive) species will begin to evolve based on a physically correct, converged initial solution, rather than from a “cold start”. Temporal evolution of the plasma species and the reduced electric field. 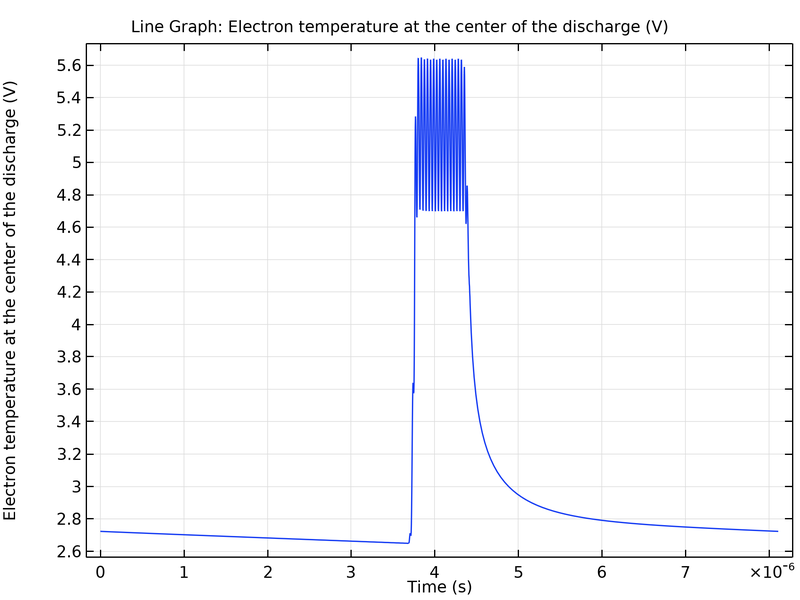 Plot of the electron temperature in the center of the reactor vs. time for a pulsed CCP discharge.